I first heard about this technique from David Gurteen who used it with a group of librarians in Ireland. He told me the story of trying to get them to do some strategic planning and how they kept going back to the negative as their libraries were all being closed down (now doesn’t this sound familiar). He then decided to take them into the negative space to let them vent and his topic was – What would you have to do to ensure your library was closed? Apparently the session went exceptionally well and so I decided to try this for myself. I have now used this technique with many of my clients and also at the Origins conference in Singapore last year with great success. The May meeting for 2011 will be a Reverse brainstorming session to uncover how to introduce or improve collaboration in your organisation. Reverse Brainstorming helps solve problems by combining brainstorming and reversal techniques. Humans are better at being negative than positive and this technique goes negative in order to realise the positive. More theory and practice. Come along and learn this relatively simple but powerful technique for both identifying risk and articulating the problem you might have in your organisation. On Wednesday morning this week I was fortunate to have the opportunity to facilitate a World Cafe as part of the Institute for Information Management conference and Information Awareness Month here in Canberra. This was a fantastic experience and the 35+ participants came away with some really meaty foundations for the development of a Community of Practice around Information Governance. Virtual or physical or both? How the CoP would be governed and coordinated? What would be the topics covered? What would our online presence look like? How do we know if its working or not? This is a great way to get your Community of Practice started as it engages those who are interested and provides a sound foundation for going forward by setting out what it is you are trying to achieve as well as the risks along the way. For the last 20 months I have been working with the Australian River Restoration Centre which took over some of the Knowledge for Regional NRM Program projects I worked on at Land & Water Australia (LWA) to maintain their legacy after LWA closed down. The National Water Commission, Murray–Darling Basin Authority, CSIRO Water for a Healthy Country Flagship and eWater CRC are combining their best researchers and practitioners to provide participants with the opportunity to choose from these eight different topics. In addition to the workshops will be excellent keynote presenters, with Dr Matthew Colloff and Ash Donaldson challenging us with new research and thinking in water science and knowledge management. To find out more go to the Forum site. What skills, competencies and experiences do you think you need to be successful? In June 2010 at the Annual SLA conference in New Orleans, Karen Huffman put together this wonderful set of interviews with the KM Division members – and included the wonderful Patrick Lambe who was at SLA as one of the KM Division spotlight speakers. It is interesting to note the variety of skills we all thought were needed to be effective in the KM world. As an information professional, do you find you are constantly trying to prove your worth to your organisation? Many of us have learned to collect and aggregate statistics about our products and services, but what is the quality of service and value add we offer to our customers and our organisations? As librarians we need to be able to effectively demonstrate the impact we have on our clients. Not just how busy we are but where and how we make a difference. Come along on the 4th of February 2011 when I will be conducting a 1 day course on How to evaluate your library and information service using narrative techniques. The course will be run in Sydney after the Information Online Conference which is being held at the Sydney Conference & Exhibition Centre. I have been conducting this course in the USA at the Special Libraries Association Conference for the last 2 years with fantastic feedback. If you are interested you can download an Evaluating information services using narrative techniques flyer and a Registration form. I have also co-authored a paper on this technique which was published in in Information Outlook in February 2010. There is a version of the paper freely available (without diagrams) here. I can’t believe how quickly the annual actKM conference has come around again. This is always my favourite conference every year in the knowledge management field. I love the combination of a couple of speaking heads (not too many – just enough so the more conventional managers can see the traditional value of the conference) and the interactive sessions where you get to do and learn. Over the years I have learnt so much from this conference that I use in my own workshops and presentations. I love the challenging facts and figures as well as the new techniques and ideas. It is also such good value with a price tag of $690.00 per person which includes 2 days of brilliant conference and the conference dinner – which this year will be held at Teatro Vivaldi on the ANU Campus. The program is once again stimulating and different – for full details go to the conference website. We have also been fortunate enough to have David Gurteen back with us this year presenting on Positive Deviance and KM. After the conference on Wednesday the 20th of October, the Australian River Restoration Centre consultants (Siwan Lovett, myself and Matt Moore) will be conducting a 1 day workshop on Connecting Through Conversation : Narrative Techniques for Organisational Knowledge Sharing. This one day workshop is designed to introduce participants to some knowledge sharing techniques which won’t break the bank and are simple to implement in your organisation. This one day workshop will only cost you $395.00 – can you afford to miss it? We would love to see you there – or we can design the course for your location as well. I just had to post this TED talk by Sir Ken Robinson as it resonated with one of the main things I have always told my daughters. If you love what you do in life it won’t be work – it will be fun. Make sure what you choose to do is something you love. Don’t let anyone else choose your future for you. What is HartKnowledge or ‘heart knowledge’? I first heard of the concept as a native American philosophy which referred to the heart as the main driver for our existence and the most important aspect of our knowledge. I read about this through the Lifelong Learning Online – the Lewis & Clark Rediscovery Project which gives the most wonderful description of heart knowledge. Why the world needs knowledge brokers…. For a long time now I have been advocating the role of the ‘knowledge broker’. When I worked at Land & Water Australia (LWA) they had a whole team of what they called ‘knowledge brokers’ but I am still uncomfortable with the role these team members took on as it did not really reflect my understanding of a knowledge broker. The LWA definition states “Knowledge Brokering – Focuses on connecting people interested in an issue, it helps build relationships and networks for sharing existing research and ideas for stimulating new work. 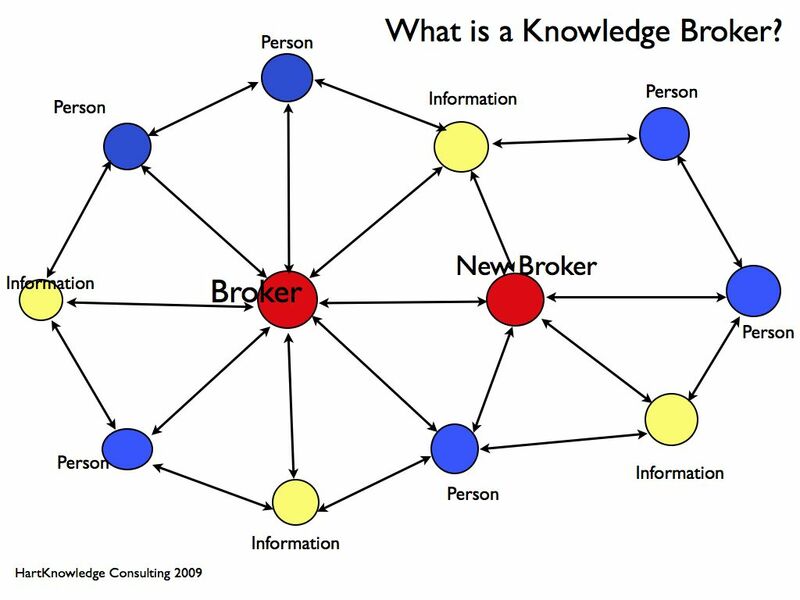 Knowledge brokers provide links between different entities or individuals that otherwise would not have any relationship. It is a dynamic activity and is not simply focused on moving information from a source to a recipient.” It is the last sentence that hits home. As a ‘recovering librarian’ all too often we see the role of the librarian as distributing information to a recipient. It is such a passive role and requires the information seeker to ask for information and then have it delivered. Librarians really need to think outside this role and into a proactive role – and not just running alerting services to their clientele. The information professional needs to get outside the walls of their centre and go out and be part of their organisation and build trusted and strong relationships with their cleints. As we hear so often it is all about building trusted relationships (my old team used to call it ‘not just a one night stand’). I am very much of the view that all staff in organisations have a brokering role to play. The power in the brokering position becomes obvious when you undertake a Social Network Analysis in an organisation and realise how important relationships are to successful outcomes. The whole idea is that each broker is empowered to create a new broker and that no one actually owns the information or knowledge that is being shared. The idea is to encourage collaboration and sharing. As my first post this makes me a bit nervous. If you want to hear more about my opinions on the role of librarians as knowledge brokers listen to the podcast interview I did with InMagic about 12 months ago. Would love some comments on this…..